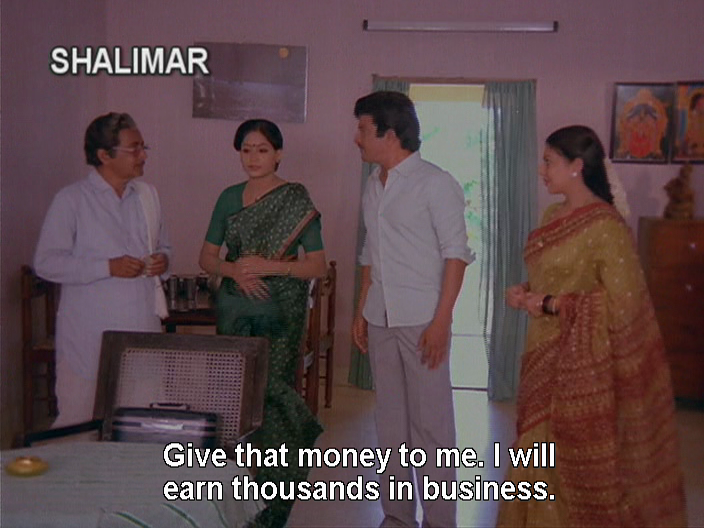 One of a half dozen films K Raghavendra Rao churned out in 1986 (including the awesome Kondaveeti Donga), Chanakya Sapatham again pairs Chiranjeevi with Vijayashanti in a ripping yarn of smugglers, flight attendants and the Indian Customs department. 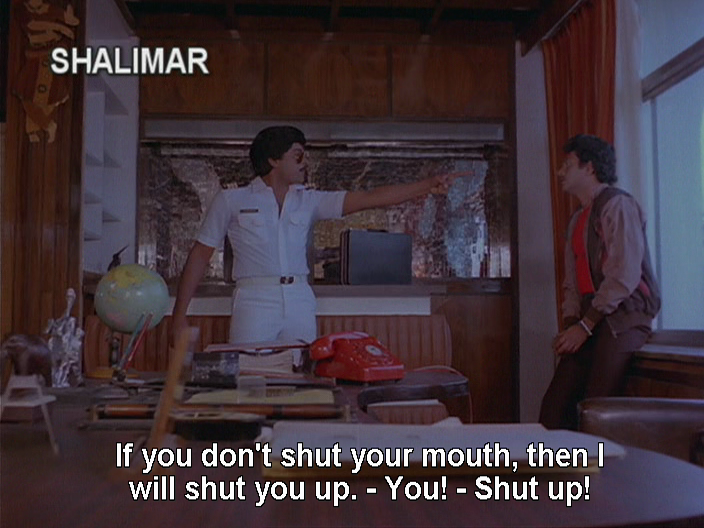 I wouldn’t go so far as to call Chanakya Sapatham a neglected masala masterpiece but I do think it deserves some love. 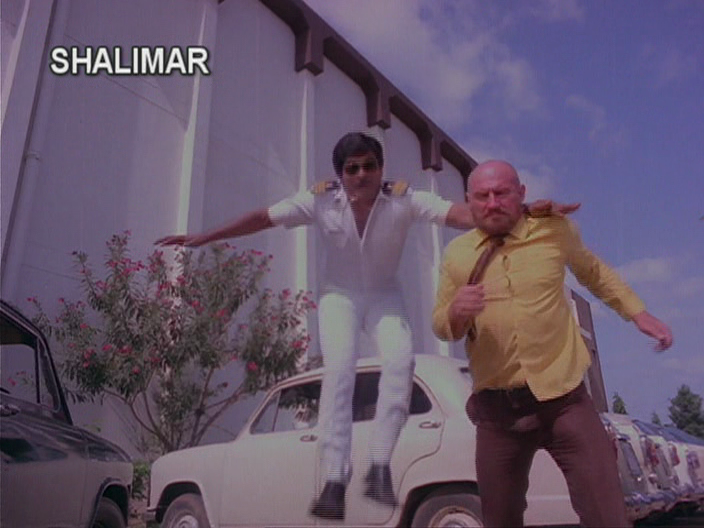 Shashi or Sasirekha (Vijayashanti) is a flight attendant, unwittingly caught up in a smuggling operation by BOB CHRISTO! 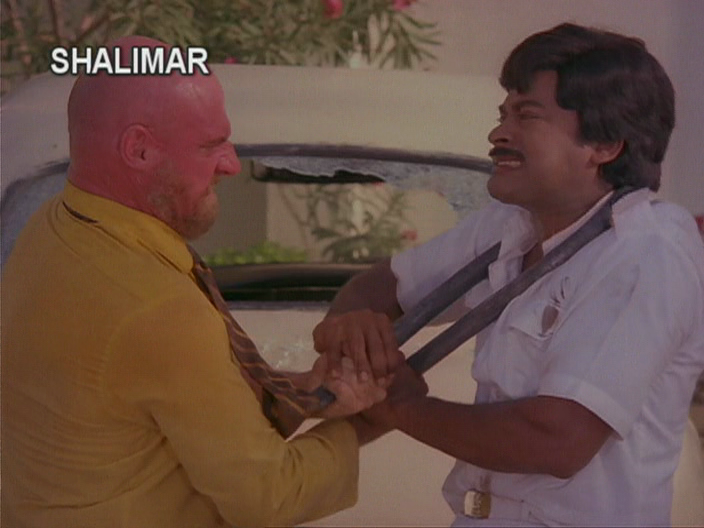 Bob, with his trademark poor judgement, hides a pouch of diamonds in her blouse (no, I don’t know how she didn’t notice) and when he tries to get it back, Shashi puts up a decent fight and Chanakya (Chiranjeevi) leaps to the rescue. 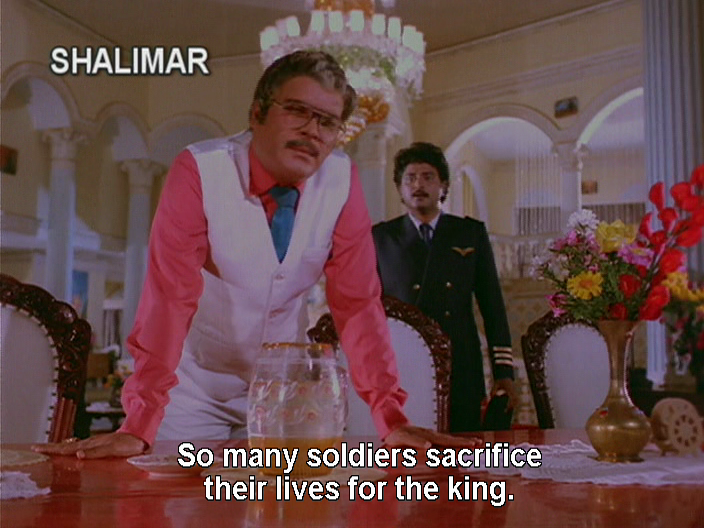 It’s like the finale of Doodh Ka Karz only with flying Chiru instead of snakes. Naturally Shashi is swept off her feet by the dashing customs officer in his very snug uniform. They fall in love through a Kodak moment and product placement. 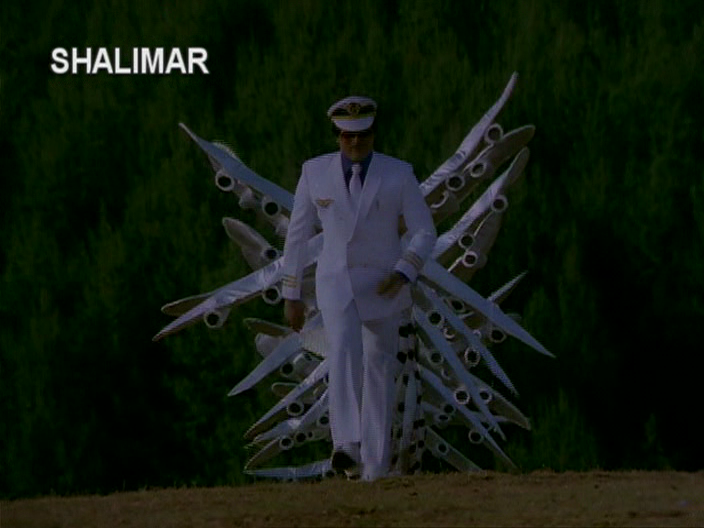 Oh the visual metaphors. 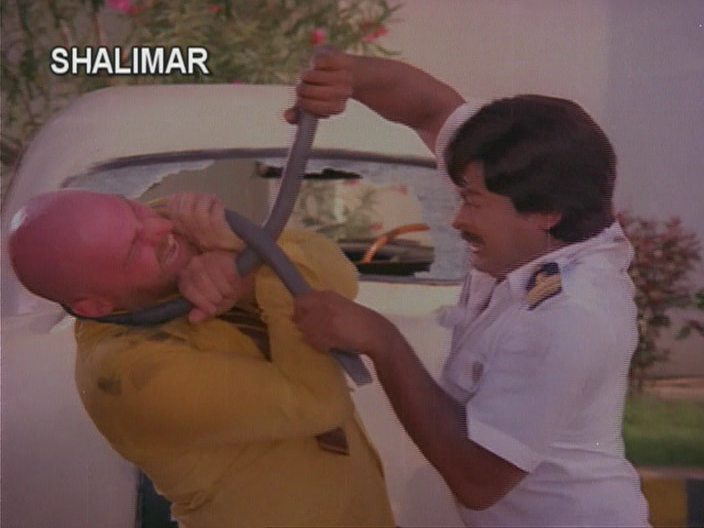 Rana (Rao Gopal Rao) is the main villain. Bless the Paruchuri brothers for going to the trouble of trying to think of vaguely sane reasons for him to do some things, and then make him explain himself. It was unnecessary but greatly appreciated. Rana’s chief henchman Ranga is a flamboyantly unpleasant creature and Rana’s son is a nasty piece of work. 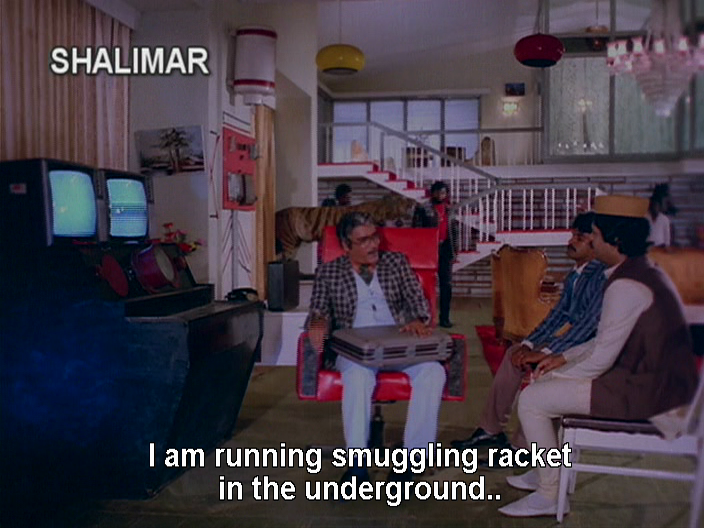 The son (Sudhakar) works for the airline, or at least owns a uniform, and was in on the smuggling but hasn’t quite got the wattage to do much off his own bat. They have little depth of character, so I was pleased to see they have that nice tricolour chandelier in their house, and I think I also recognise the stuffed tiger and the mysterious beep boop machine from previous outings. Rana runs a Natural Health Remedy Centre. 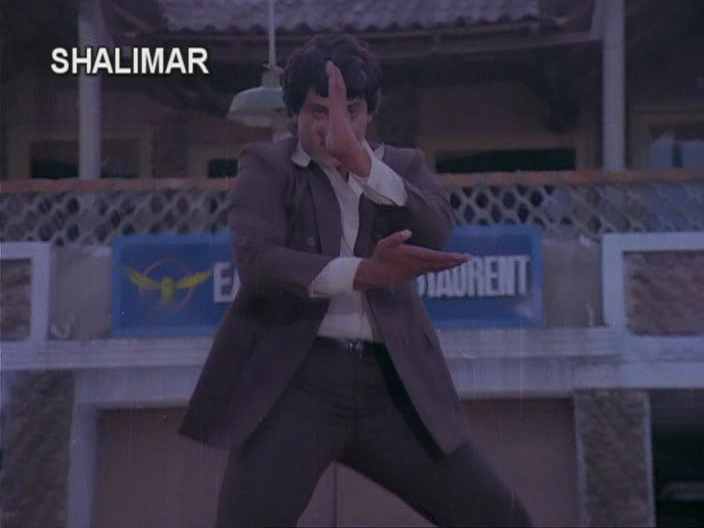 I liked the apparent lift and shift substitution of ‘karate school’ for ‘yoga school’ as a background for some of the fight scenes. Chanakya is hot on Rana’s trail, but frustrated at every turn by the sleazy businessman’s connections and ability to weasel out of any trap. 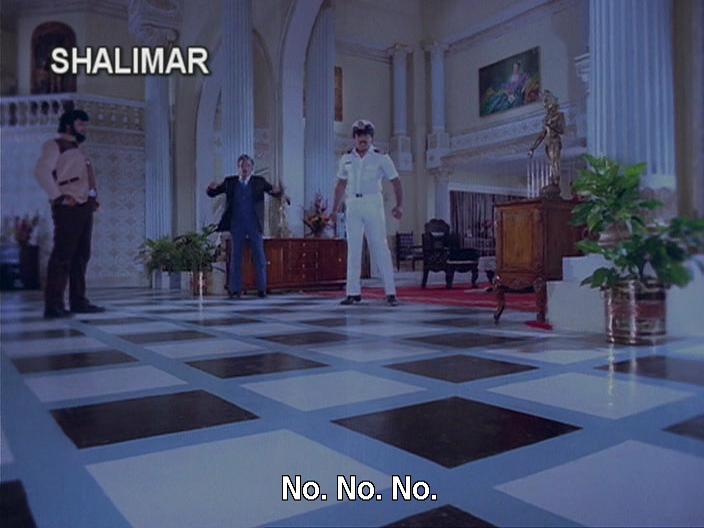 But how do they not see Chiru in surveillance mode? His pants are so blindingly white. Both Shashi and Chanakya are close to their families. Shashi’s sister Savitri was married but due to dowry issues (Shashi was robbed on the way home from the bank), the in-laws turned her out. Financial pressures are causing strife at home, and Shashi is the only one who seems to have a chance of fixing things. The baddies have their eye on her as a way to get to Chanakya, and offer her a smuggling job that would pay for Savitri’s dowry and put the family back on an even keel. She traps the smugglers and gets a reward which she intends to use to pay the outstanding dowry and get her sister settled. Chanakya’s family are close and affectionate, and I liked their domestic scenes. There are so few times when an older married couple get to show an affectionate or playful side, and I really liked those moments between Kaikala Satyanarayana and Annapurna. Chanakya is the only child and, of course, the centre of his parents universe. When Rana sets Nagarjuna up to be arrested as a smuggler Chanakya is bent on revenge and justice, which may actually be more or less the same thing in this instance. Chanakya and Sasirekha are united by their mutual attraction and also the mission to shut Rana down. I liked that they were both smart, both tried to take care of things themselves, but could accept or even ask for help when they had to. Chanakya understood her reservations and made an effort to address her concerns quite plainly to avoid further tension. The relationship development was all quite sensible (for a film) as well as providing fuel for some excellent concepts for Chakravarthy’s songs. 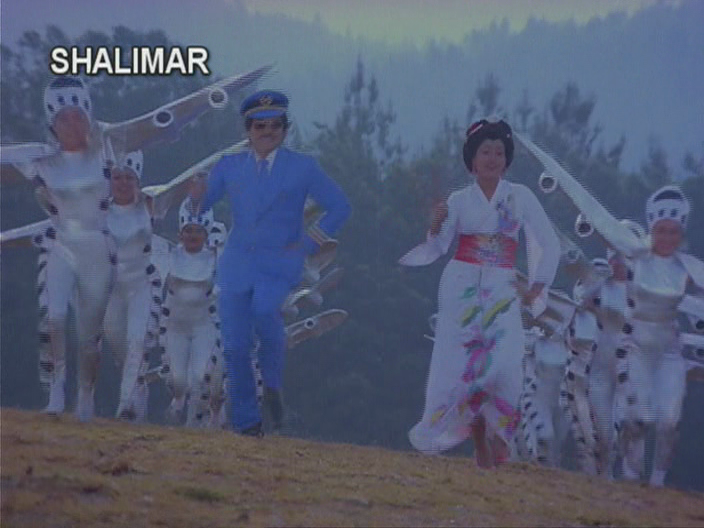 Apart from the usual hillside prancing, the songs take place around a giant camera, a plane made of flowers with dancers dressed as airplanes, and in and out of a tray of photo developing chemicals, or even just surrounded by neon tube lights. 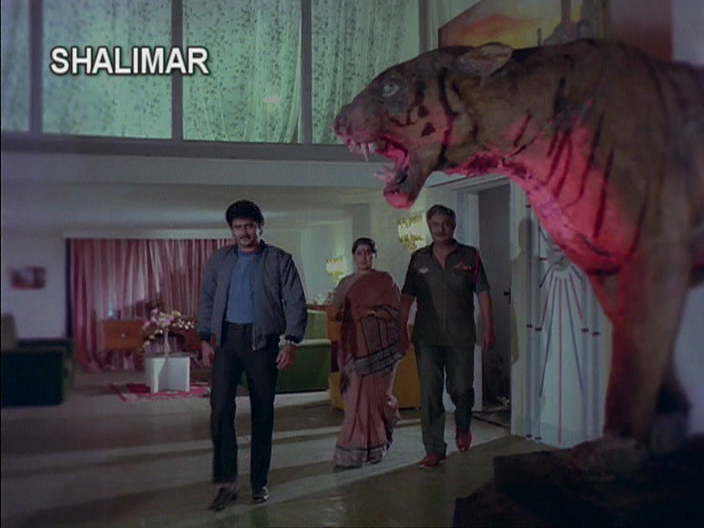 Yes, this is a movie that embraces the technology of 1986. 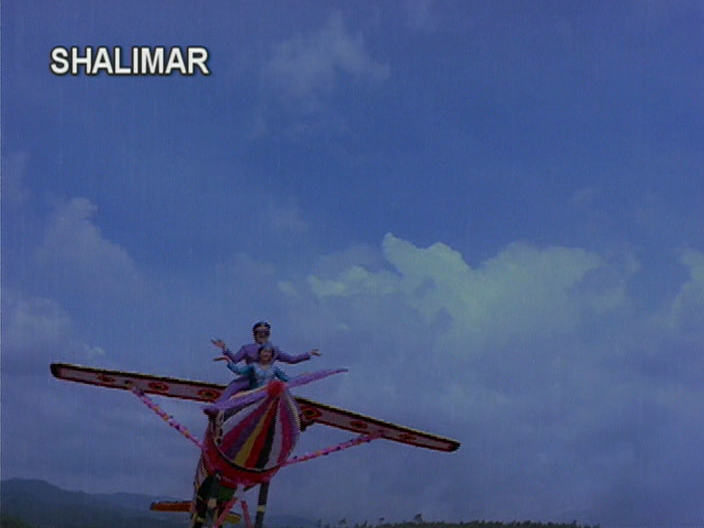 And Shashi generally looks fine (for 80s filmi fashion), even in the more imaginative sequences. 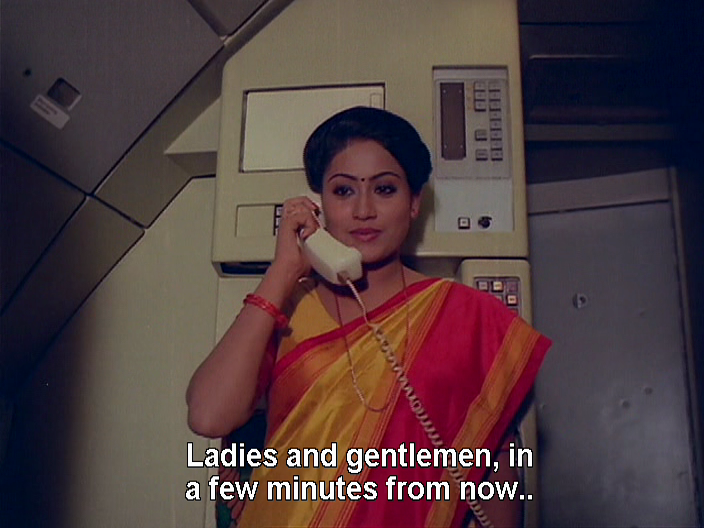 Vijayashanti demonstrates she has nailed the saree run with hair toss. My biggest disappointment was Chiru’s footwear which was less than spectacular and relied heavily on the monotone ankle boot. But I rarely enjoy product placement as much as I did in this film – well done Luma Lamps people, well done. 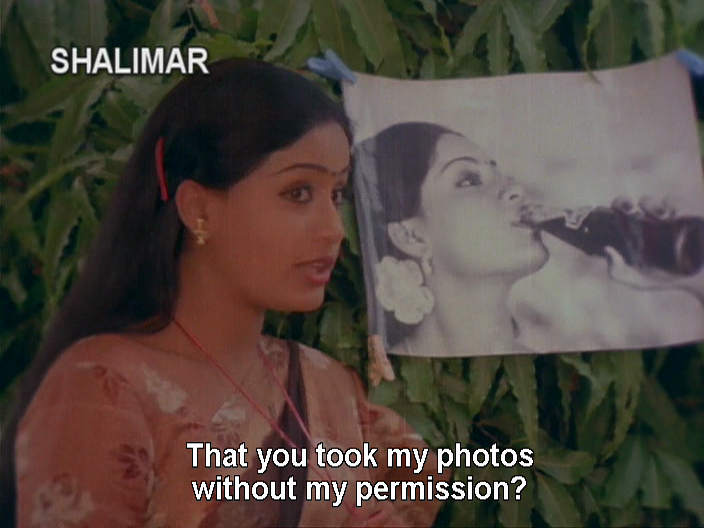 Vijayashanti is always a pleasure to watch, and I like her rapport with Chiru. They’re well matched in the choreography, and neither of them lacks energy or commitment to the role. Shashi is smart and while she wants to sort things out herself, she appreciates Chanakya’s sincerity in wanting to help her and considers his offer rationally. I liked that he had to put his cards on the table before she would accept his gift and they didn’t play silly games. 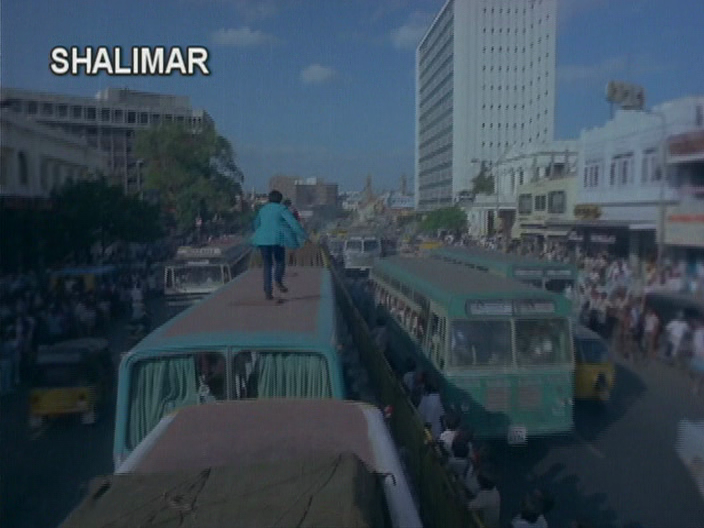 Also, this is a remarkably non-rapey film for 80s mass. The villains stay on task and when they threaten Shashi it is because they need her to do something for them, not run around screaming. I liked the very specific design and fit-out for some action scenes. I would never have thought to create a factory full of…exploding ice…but it came up a treat. I always enjoy a good fight in a factory full of stuff that is only there for the hell of it. More exploding ice! A statue! Things in barrels! A luge run! 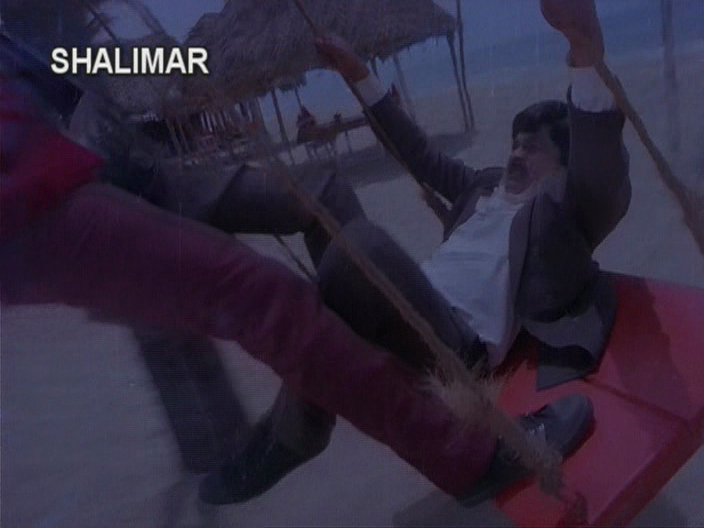 And a later fight on the beach uses swings. So fun! 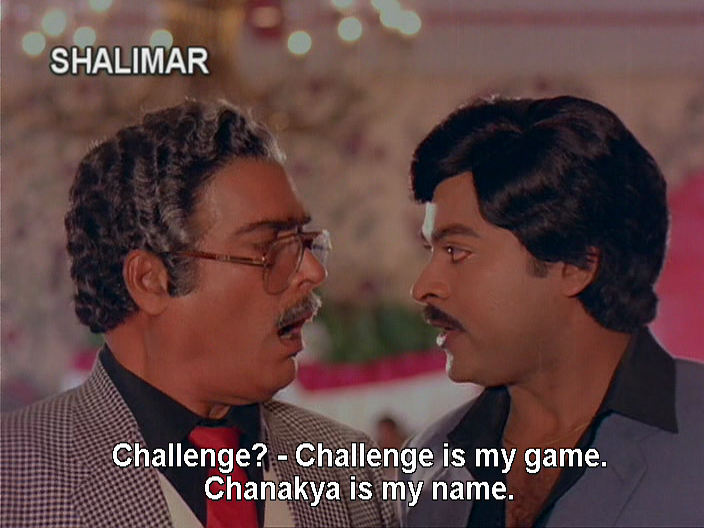 There is more than a nod to Jackie Chan and the Hong Kong school in some of the fight choreography and Chiru has the right attitude to carry it all off – he milks those bendy iron bars and flying kicks for all they’re worth, and then some. 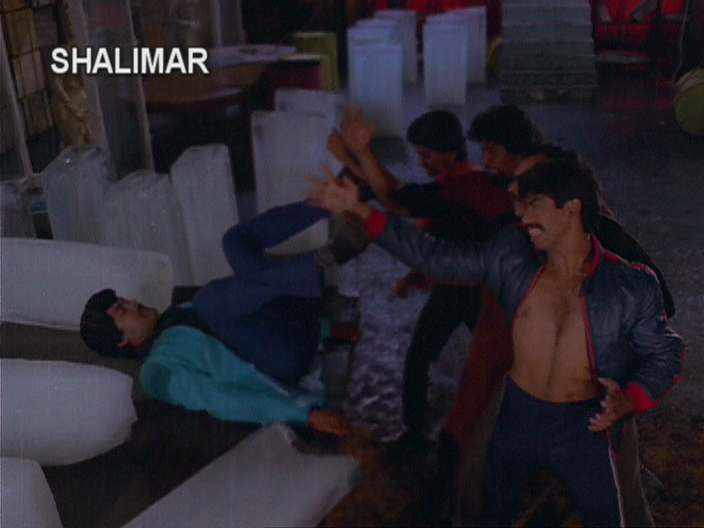 The earlier action scenes are funny but still a bit exciting. The finale starts out with an unfortunate tendency to Comedy before the drama and action ramps up again. 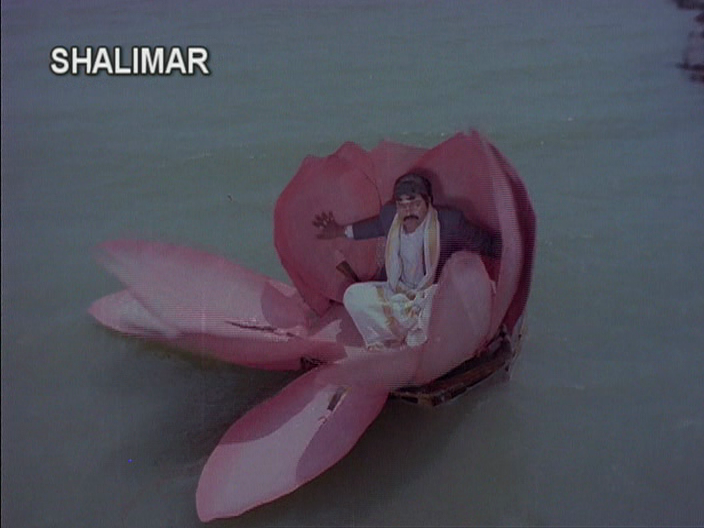 I could have done without most of the last 30 minutes, well maybe except for the bit where Chanakya rocked up not only in disguise but in a lotus submarine. 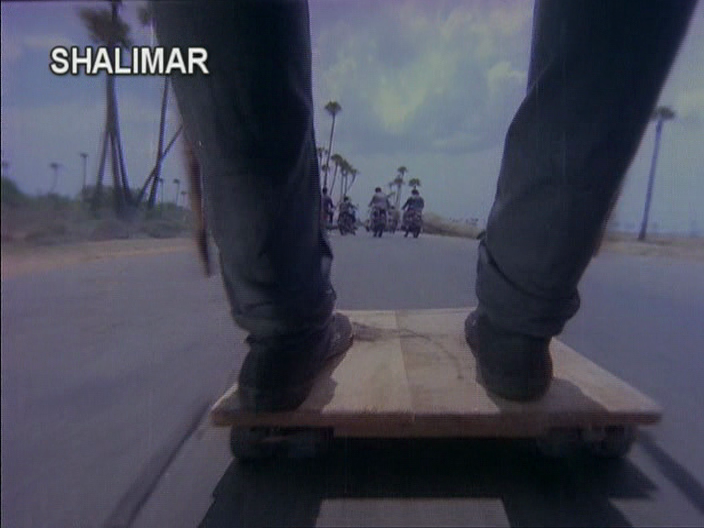 But then the movie redeemed itself with what may be the best use of a wheely board and improvised ski poles since Shashi Kapoor in Duniya Meri Jeb Mein. 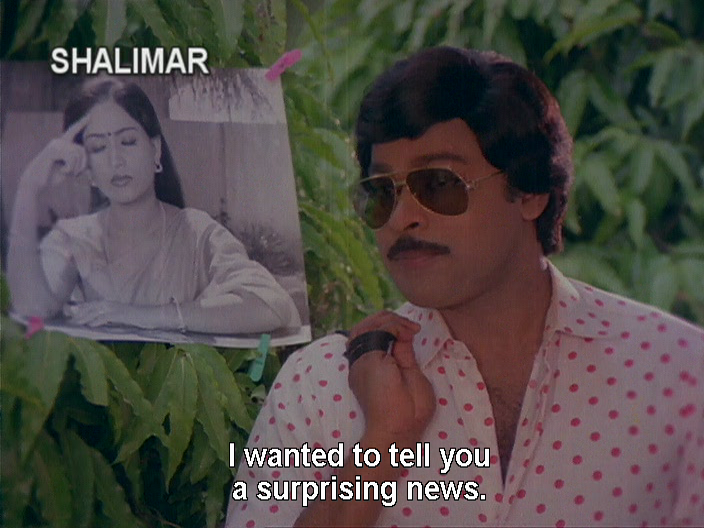 Vijayashanti and Chiranjeevi are a delightful on screen pair, and while Chanakya Sapatham doesn’t break new ground it does what it does so very well. 4 stars! 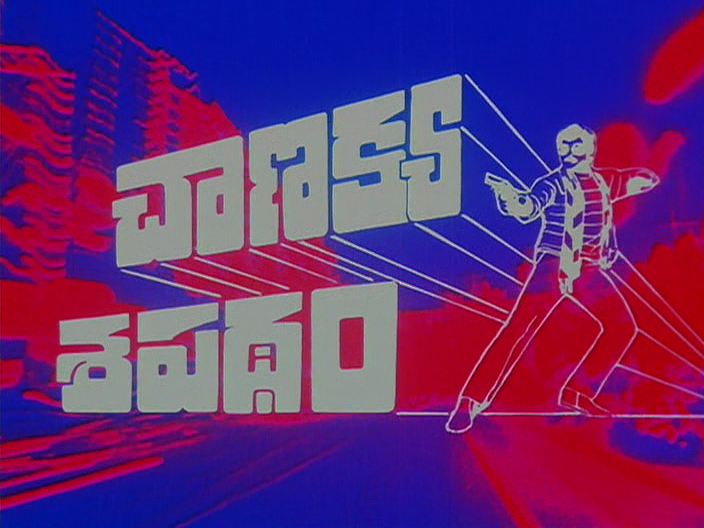 This entry was posted in Tollywood and tagged Annapurna, Bob Christo, Chakravarthy, Chiranjeevi, Chiru, K Raghavendra Rao, Kaikala Satyanarayana, Rao Gopal Rao, Sudhakar, Telugu, Vijayashanti. Bookmark the permalink.